METRO represents a group of young international artists who work in the fields of video, installation and sound conceptually analyzing the urban context. 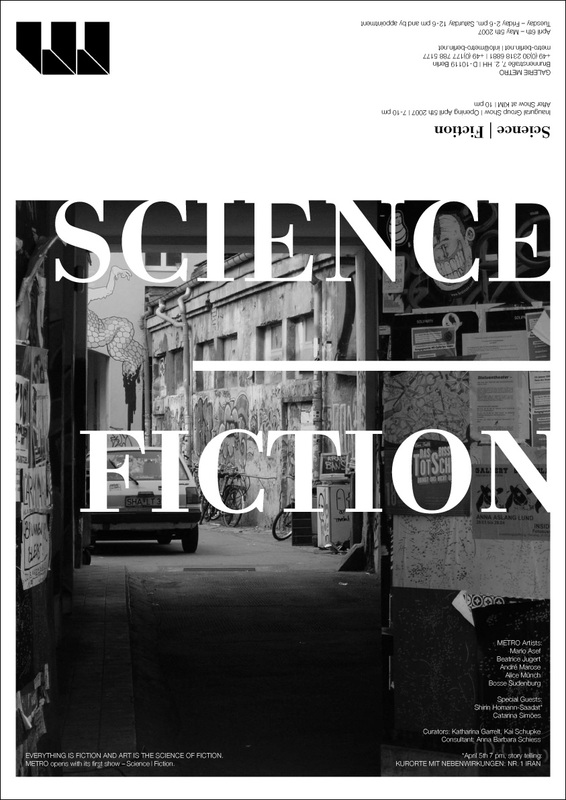 In this inaugural group exhibition, the term science fiction is taken literally according to the motto everything is fiction and art is the science of fiction: ‘fiction’ stands for the world as narration and thus for the endless possibilities of its shape. ‘Science’ suggests the artists’ experimental take on this narration. Mario Asef’s audio work “Intervall &gt;c” is a compilation of field recordings taken from different urban spaces designed for ephemeral transit as well as from audio documentation of various media. These digital interventions of electronic nature co-operate in order to create a dramaturgy that emphasizes the both musical and narrative characteristics of the audio waves. Beatrice Jugert’s “Fan Club” talks about a society defined by symbols and thus about a society of symbols as virtualization. Through a loss of these references, everything gathered by the symbol would be lost as well – the society’s rituals and signs would be emptied. A society needs to narrate itself in order to recognize, remain and develop itself. The movement of the fan represents this dynamic of symbols. André Marose’s series of international exhibition titles “Full Moon (Taking a Walk)” is a work that is characterized by the artist’s skeptical approach towards art. As these titles are removed from their original context, they only pose questions. Similar to watching the moon, the expected gain of insight is not easily fulfilled. However, asking questions usually furthers the way to wisdom. But sometimes, it seems to be better taking a walk. In Alice Münchs wall piece “Tell Me Something About the World” statements are being investigated. To constitute something always also means to formulate a statement, which is then put into a relationship with the viewer. Through the motive of the hare, half present (positive) and half absent (negative), a space is created allowing different viewpoints. Is the viewer addressed? Or is she/he the one questioning? Bosse Sudenburg’s “Modern Friendship” is an artistic and formal exploration of space and the body. Space as an abstract dimension is fiction, as only those spaces exist that are physically and sensually experienced. Created by everyone over and over again, each space can therefore be seen as an interactive performance between the individual and the world. Shirin Homann-Saadat’s “Kurorte mit Nebenwirkungen” is a picture book that combines photographs with fairy tales based on real events. Further chapters of this ongoing project are dedicated to the Kosovo and Alabama. During the inaugural opening of the gallery, the artist reads fragments of her Iran chapter #1: “Die Strafe der Götter” accompanied by a slide projection. While seeing her studio being pestered by ants, Catarina Simões became aware of the insects’ dystopian potential and decided to turn their characteristics into character traits. “The Home Planet” is thus a video meta-fiction, which, while depicting the artist’s reaction to a plague infestation, also acts as a case study about the narrative nature of our perception of reality. Through the staging of a documentary, the video takes the form of a science fiction tale. Kai Schupke and Katharina Garrelt. Please contact the gallery for further information or image materials.